It is nothing short of typical for today’s goaltenders, NHL or otherwise, to play a moderate, reliable style, being aggressive when needed and conservative when needed— come out of the blue paint on breakaways and straddle the top of the crease under zone pressure. It makes sense then, that when Henrik Lundqvist spends an entire game near his goal line, or Jonathan Quick acts like a third defenseman, that it makes us wonder how they enjoy the success they do. Here, I break down the pros and cons and give tips on both deep and aggressive play. 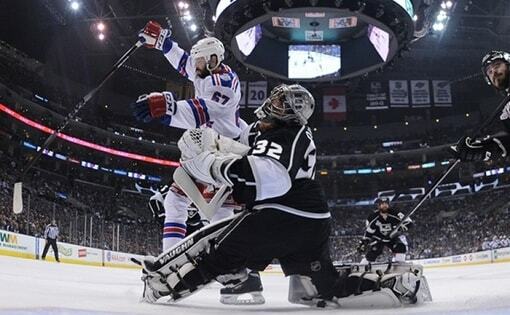 New York Rangers star Henrik Lundqvist is a prime example of a goaltender with a deep playing style. The style Lundqvist employs is best described as an “inside-out” strategy, always resetting yourself and starting on the goal line, coming out from there to get in position to make the save. Longer reaction window: Lundqvist claims that by being deeper in his crease facing a shot, he actually has more time to make a save. Whether the save is calculated or reactionary, being further back in the blue paint actually gives you more time, albeit a split second, to get your glove or blocker over to stop the puck. Less area to cover: A huge benefit of playing deep in the crease is that it cuts down on the distance you have to push on lateral plays. Say the opposing team enters the zone on a 2-on-1 and you’re positioned for the shot. The puck carrier passes across to the player driving the net, and he is trying to bank it in. If you are a foot out of your crease, you would have to push back diagonally 5 feet. However, if playing deep and defensively, you could make the push, no problem. Always square: Perhaps the biggest benefit of a deeper playing style is that it is easy to be square to the shooter on every shot. Because you are deeper in the crease, you have less distance to cover and therefore can square up to a shooter on the rush or on a passing play easier than an aggressive goalie. It may appear as if you are giving up more net, but with more reaction time it could work in your favor. More visible net: One of the big criticisms of playing deep is that it “gives the shooter more to shoot at,” or rather, the appearance that you are not covering much of the net. Depending on reaction time and where the shooter is, this could be a huge con to a deep play style, because if shooters see daylight and take advantage of it, a lot of pucks could get past you. Room for deflections: A tip every goalie should know is the closer you are to a player screening you, the easier it is to stop a tipping play from a puck thrown at the net. If the screening player gets a stick on the puck, it has less room to bounce and find its way past you. Therefore, if a shot is sent toward the net and you’re back in your crease trying to see it, it could be deflected and behind you before you know it. Longer time to challenge: A pretty self-explanatory downside of playing deep in the blue paint is that it takes longer to come out and challenge when you decide to. If you’re coming off of your goal line for a breakaway or a 2-on-1, you could take yourself out of the play to begin with by being too slow. Who is it for, and how do you practice it? Goalies with sub par skating ability should try out a deeper playing style. Staying back a bit more takes the heat off of your movement and brings the focus to your hand-eye coordination and fundamental puck-stopping techniques. Anyone getting beat on odd-man rushes or finding it hard to stay square with the play might benefit from hanging out in the blue paint. To effectively use this style, try narrowing your stance in the crease when facing a shot. A narrower stance (while still keeping your knees adequately bent) makes you taller and gives you the option of making a save without dropping into butterfly. So to practice, try a more narrow stance, be patient and decide whether to drop, and rely on your hands to do the work. Also, try to get good at holding onto the puck on any type of shot to get a whistle. 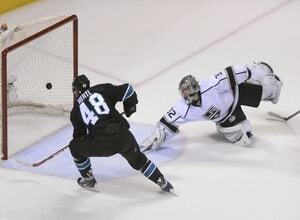 If you have ever watched a Los Angeles Kings game, you’ll have noticed Jonathan Quick. You may have yelled, “What are you doing? Get back in the net!”, however, despite giving fans a heart attack every now and then, Quick is consistently one of the league’s best goalies. So, what is it about his play style? Opposite from Lundqvist, Quick plays an “outside-in” style. This means that he starts from an aggressive position and matches his retreat into the crease based on the attack. “Take away the net”: Imagine a player is chasing a loose puck hard into the opposing team’s end. When he reaches the puck and lifts his head up to see what he has to shoot at, he sees the goalie way out of his crease and is forced to take a quick, lackluster shot. The absolute biggest pro of playing aggressively is that you appear to take away more of the net, so the shooter thinks they have nothing to shoot at. 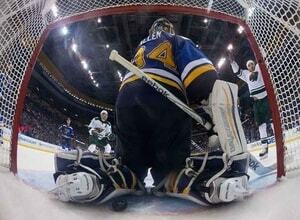 For a goalie vs. shooter situation, being aggressive almost always pays off. Make the first move: Making the first move against a shooter isn’t always good, but it’s not always bad either. In any event, being aggressive against a shooter can give you the opportunity to make the first move and can often times end a dangerous situation. If the puck carrier feels pressured to shoot or pass because of an aggressive goalie, it could end the play and work out in the goalie’s favor. Dictate a play: Goalies like Jonathan Quick end up dictating the play a lot of the time by being so active and involved with their defenseman and aggressive in both rush and sustained zone pressure situations. An aggressive goalie has the potential to act as a third D-man and take control of the game, slowing it down or keeping it going to their liking. The more aggressive you are, the more control you’ll typically have. Taking yourself out of the play: A potential downside of being an aggressive goalie is that you can take yourself out of a play if you hesitate or don’t execute properly. If you’re going to come out and poke check or play a loose puck, you’d better make sure that you and your defense are communicating so nothing goes wrong. Lower stance=less lateral strength=harder saves: To play an aggressive style, you usually need to use a lower stance for more aggressive, athletic movements. A downside of this, however, is that it could be hard to find your footing and get a good, solid push over to the puck when you need to. Jonathan Quick makes a lot of highlight reel saves for the Kings, but a lot of the time it’s because he’s behind the play due to his aggressiveness and has to make up for it by dislocating his hip and doing the splits. To each their own, but just know that you’re going to have to stretch before a game. Crease play can degrade: Being aggressive is a good tactic in many situations, but as for crease play when shots are coming from low and close-in, it’s not always the best mode of play. Being overly aggressive and active can cause you to slip up, lose your footing, find yourself out of the blue paint, etc. There are many factors which cause crease play to be a weak point of the play style. Goalies gifted on their feet and with their hands should practice an aggressive play style. The two biggest strengths of an aggressive goaltender are their skating and their puck playing skills. Goalies who like to use butterfly most of the time should try it as well, as the two go hand-in-hand, along with a low stance. In practice, try focusing on a couple of things: widen your stance so your knees are farther apart and lower to the ice, pass the puck back and forth and rim it around the boards for at least 5 minutes with your goalie partner or another player, and practice skating and sliding around the circles and in your crease. Also, work on a quick poke check. When it comes to comparing deep and aggressive play styles, it really comes down to the individual goalie. No one style is better than the other, but one style is better for you specifically than the other. If you are searching for a style or just trying to tweak your game a bit, try both and see which one fits you.